Official Statement: Dhruv Vikram's debut film VARMAA to be re-shot completely with new director as the makers not happy with Bala's work. 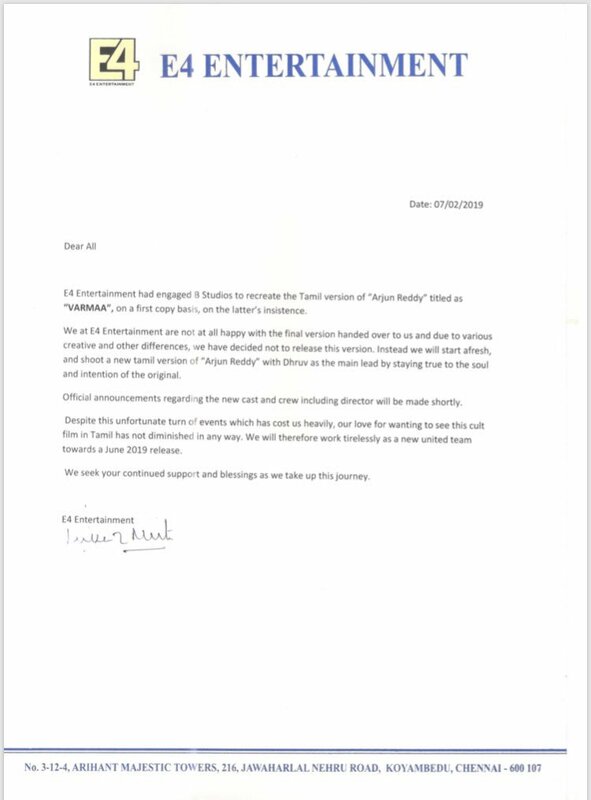 There's definitely something going behind doors for such darastic action as no matter how good they make the film now, its not going to recover money, while if they had released this version, they had a good money for digital and Sattelite rights and would have made some money theatrically as well, atleast producer wouldn't have lost anything. But now, lol. Damn, that's a big step. I guess SRK should've done this with Fan, JHMS & Zero. Fan - Release it on Digital. Zero - Change the writer & director. JHMS - Just release it's songs as an individual album, end of. BTW, has anything ever happened in Indian cinema before? If he doesn't watch his movies before release how can he do this. Any idea about budget? 20-25 cr wasted. Check out the trailer of Bala's VARMAA *ing Dhruv Vikram & Megha. Tamil remake of Arjun Reddy. Check out the official teaser of VARMA *ing Dhruv Vikram & Megha Chowdhary. A Bala's vision of Arjun Reddy. Arjun Reddy Tamil remake now titled Adithya Varma. Banita Sandhu & Priya Anand join Dhruv Vikram. Gireesaaya replaces Bala.